Each successive level of protein folding ultimately contributes to its shape and therefore its function. Protein structure depends on its amino acid sequence and local, low-energy chemical bonds between atoms in both the polypeptide backbone and in amino acid side chains. Protein structure plays a key role in its function; if a protein loses its shape at any structural level, it may no longer be functional. 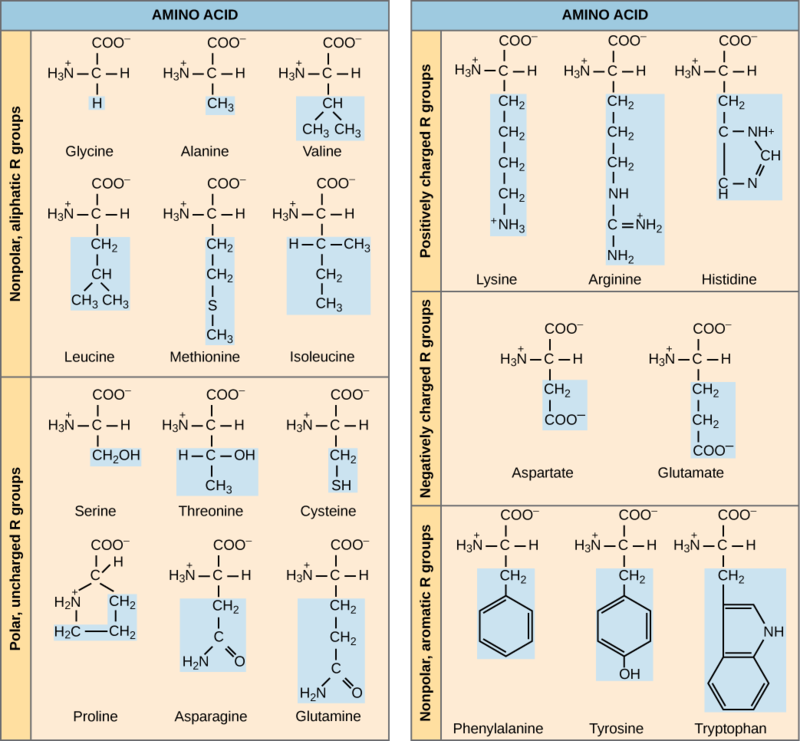 Primary structure is the amino acid sequence. Secondary structure is local interactions between stretches of a polypeptide chain and includes α-helix and β-pleated sheet structures. Tertiary structure is the overall the three-dimension folding driven largely by interactions between R groups. Quarternary structures is the orientation and arrangement of subunits in a multi-subunit protein. α-helix: secondary structure of proteins where every backbone N-H creates a hydrogen bond with the C=O group of the amino acid four residues earlier in the same helix. The shape of a protein is critical to its function because it determines whether the protein can interact with other molecules. Protein structures are very complex, and researchers have only very recently been able to easily and quickly determine the structure of complete proteins down to the atomic level. (The techniques used date back to the 1950s, but until recently they were very slow and laborious to use, so complete protein structures were very slow to be solved.) Early structural biochemists conceptually divided protein structures into four “levels” to make it easier to get a handle on the complexity of the overall structures. To determine how the protein gets its final shape or conformation, we need to understand these four levels of protein structure: primary, secondary, tertiary, and quaternary. A protein’s primary structure is the unique sequence of amino acids in each polypeptide chain that makes up the protein. Really, this is just a list of which amino acids appear in which order in a polypeptide chain, not really a structure. But, because the final protein structure ultimately depends on this sequence, this was called the primary structure of the polypeptide chain. For example, the pancreatic hormone insulin has two polypeptide chains, A and B. Primary structure: The A chain of insulin is 21 amino acids long and the B chain is 30 amino acids long, and each sequence is unique to the insulin protein. The gene, or sequence of DNA, ultimately determines the unique sequence of amino acids in each peptide chain. A change in nucleotide sequence of the gene’s coding region may lead to a different amino acid being added to the growing polypeptide chain, causing a change in protein structure and therefore function. 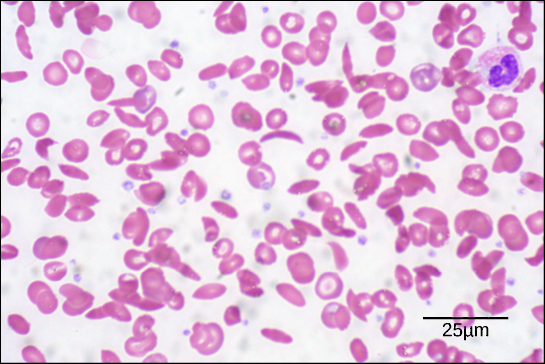 Sickle cell disease: Sickle cells are crescent shaped, while normal cells are disc-shaped. The oxygen-transport protein hemoglobin consists of four polypeptide chains, two identical α chains and two identical β chains. In sickle cell anemia, a single amino substitution in the hemoglobin β chain causes a change the structure of the entire protein. When the amino acid glutamic acid is replaced by valine in the β chain, the polypeptide folds into an slightly-different shape that creates a dysfunctional hemoglobin protein. So, just one amino acid substitution can cause dramatic changes. 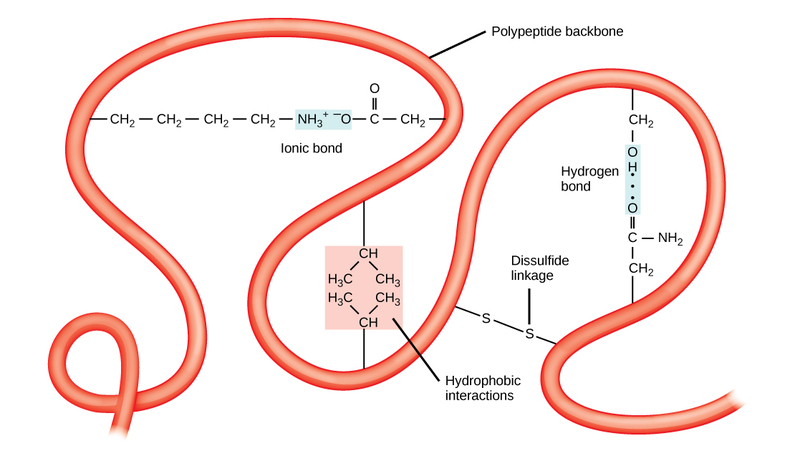 These dysfunctional hemoglobin proteins, under low-oxygen conditions, start associating with one another, forming long fibers made from millions of aggregated hemoglobins that distort the red blood cells into crescent or “sickle” shapes, which clog arteries. People affected by the disease often experience breathlessness, dizziness, headaches, and abdominal pain. A protein’s secondary structure is whatever regular structures arise from interactions between neighboring or near-by amino acids as the polypeptide starts to fold into its functional three-dimensional form. 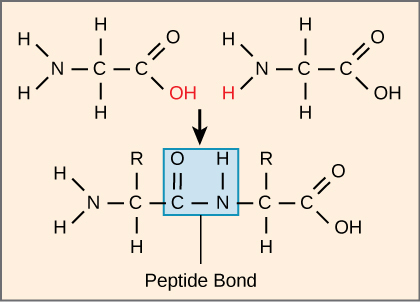 Secondary structures arise as H bonds form between local groups of amino acids in a region of the polypeptide chain. Rarely does a single secondary structure extend throughout the polypeptide chain. It is usually just in a section of the chain. 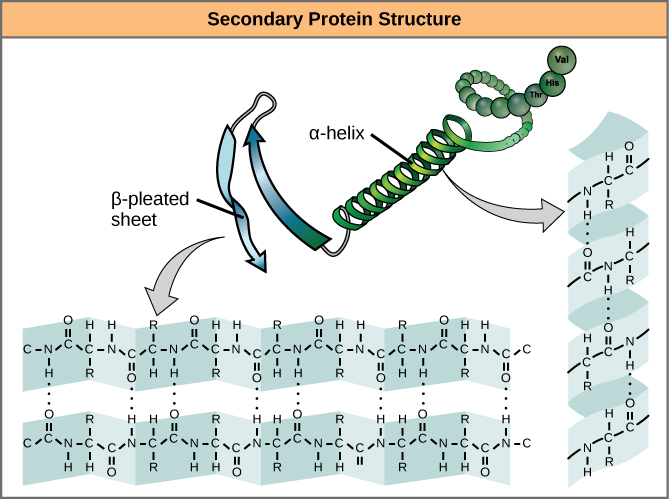 The most common forms of secondary structure are the α-helix and β-pleated sheet structures and they play an important structural role in most globular and fibrous proteins. Secondary structure: The α-helix and β-pleated sheet form because of hydrogen bonding between carbonyl and amino groups in the peptide backbone. Certain amino acids have a propensity to form an α-helix, while others have a propensity to form a β-pleated sheet. 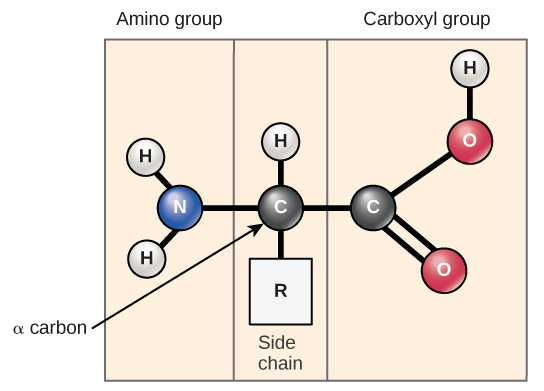 In the α-helix chain, the hydrogen bond forms between the oxygen atom in the polypeptide backbone carbonyl group in one amino acid and the hydrogen atom in the polypeptide backbone amino group of another amino acid that is four amino acids farther along the chain. This holds the stretch of amino acids in a right-handed coil. Every helical turn in an alpha helix has 3.6 amino acid residues. The R groups (the side chains) of the polypeptide protrude out from the α-helix chain and are not involved in the H bonds that maintain the α-helix structure. In β-pleated sheets, stretches of amino acids are held in an almost fully-extended conformation that “pleats” or zig-zags due to the non-linear nature of single C-C and C-N covalent bonds. β-pleated sheets never occur alone. They have to held in place by other β-pleated sheets. The stretches of amino acids in β-pleated sheets are held in their pleated sheet structure because hydrogen bonds form between the oxygen atom in a polypeptide backbone carbonyl group of one β-pleated sheet and the hydrogen atom in a polypeptide backbone amino group of another β-pleated sheet. The β-pleated sheets which hold each other together align parallel or antiparallel to each other. The R groups of the amino acids in a β-pleated sheet point out perpendicular to the hydrogen bonds holding the β-pleated sheets together, and are not involved in maintaining the β-pleated sheet structure. The tertiary structure of a polypeptide chain is its overall three-dimensional shape, once all the secondary structure elements have folded together among each other. Interactions between polar, nonpolar, acidic, and basic R group within the polypeptide chain create the complex three-dimensional tertiary structure of a protein. When protein folding takes place in the aqueous environment of the body, the hydrophobic R groups of nonpolar amino acids mostly lie in the interior of the protein, while the hydrophilic R groups lie mostly on the outside. Cysteine side chains form disulfide linkages in the presence of oxygen, the only covalent bond forming during protein folding. All of these interactions, weak and strong, determine the final three-dimensional shape of the protein. When a protein loses its three-dimensional shape, it will no longer be functional. The quaternary structure of a protein is how its subunits are oriented and arranged with respect to one another. As a result, quaternary structure only applies to multi-subunit proteins; that is, proteins made from more than one polypeptide chain. Proteins made from a single polypeptide will not have a quaternary structure. In proteins with more than one subunit, weak interactions between the subunits help to stabilize the overall structure. Enzymes often play key roles in bonding subunits to form the final, functioning protein. For example, insulin is a ball-shaped, globular protein that contains both hydrogen bonds and disulfide bonds that hold its two polypeptide chains together. Silk is a fibrous protein that results from hydrogen bonding between different β-pleated chains. 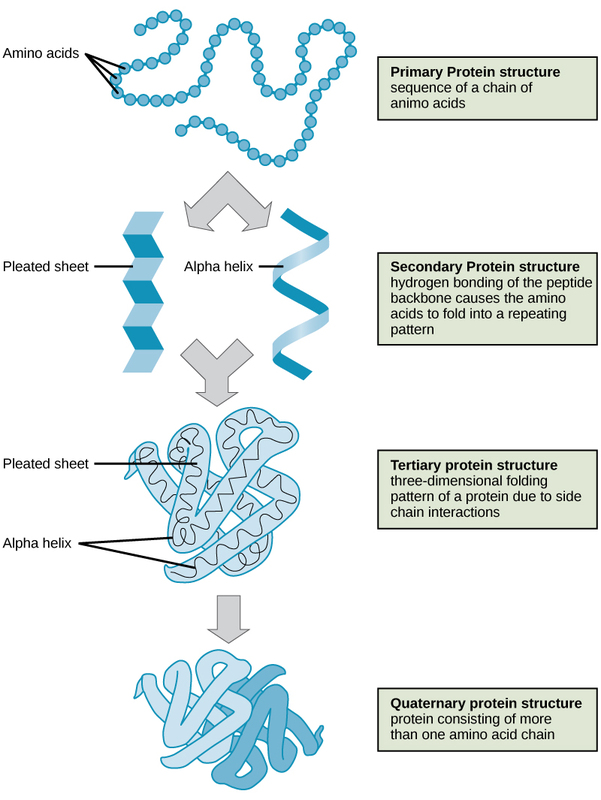 Four levels of protein structure: The four levels of protein structure can be observed in these illustrations.